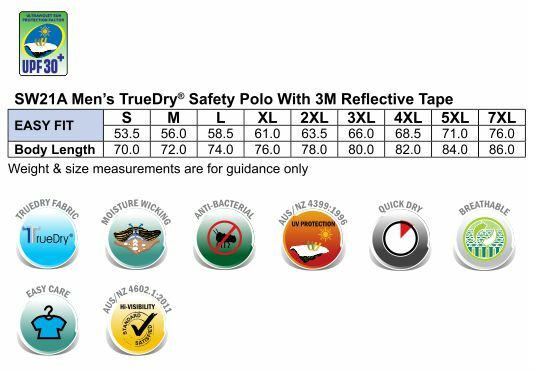 TrueDry® Mesh, 160gsm - 60% Cotton, 40% Polyester. Conforms to AS/NZS 4602.1:2011 Class D/N day & night use safety wear with UV rated. Durable polymesh knit TrueDry®. Contrast collar with two stripes & contrast lower front garment. Back garment is all hi-vis with 3M Scotchlite reflective tape for night wear. 160gsm, 100% cooldry polyester, Conforms to AS/NZS 4602.1:2011 Class D/N day & night use safety wear with UV rated. Durable polymesh knit TrueDry®. Contrast collar with two stripes & contrast lower front garment. Back garment is all hi-vis with 3M Scotchlite reflective tape for night wear.